I've not taken pictures of all of these, as I haven't actually made each of them this year. If you make them please send pictures (SuperMomsSuperKids@hotmail.ca) so I can post them. Children do not need to be wearing costumes when picture is taken. Robot: Find a box, stand it on end, take off the top flap, cut a hole in the top (may also cut it out in a large U so it can slide on), cut out a hole in each side for the arms and remove the bottom. Allow child to decorate the box however they want, or draw on basic shapes and allow them to colour it. Dress them in black or grey pants and matching t-shirt or sweater (weather appropriate). This is also suitable for a snowsuit and hat if needed. Cat Tail: Using an old pair of nylons simply fill the foot and part of the leg with stuffing (old clothes, craft stuffing, filler, etc) then tie it closed. Wrap the remaining part of the leg and the other leg around your waist and tie above the "tail" The remaining part may be cut off or hidden based upon your preference. It's that time of year again! So lets start making some great crafts with our kids! This is a simple little tree, with a whole in the top and string it can hang, or it stands on its own. Fold a piece of green construction paper in half, then in half again. Use felt or crayon to decorate the tree. I came up with this idea once in a preschool room. We needed to make a craft for the parents, and it had to be simple and use easy to find supplies. I don't have a picture of one, but I'll try to make one soon and post it. It does use a glue gun, so ensure that your child does not tough the glue gun, but it is your decision to let them help with the rest and decide where the decorations go. if you chose, wrap the tinsel garland around as well. Try and cover the metal from the hanger with the garlands. I located this Christmas Reindeer from popsicles at ChristmasCrafts.com. There are so many ideas there, but I felt this was too cute not to share. 1. Glue two popsicle sticks together to form a "V" then glue the third about one inch below the top, across the other two. 2. Glue on the eyes and the glue the pompom at the bottom of the "V" for the nose. You can tie it with a ribbon to create a tree ornament. You can visit ChristmasCrafts.com for more great ideas. Thank you for the great idea! I actually got this one from a Gymboree art class. Easy way for kids to paint a tree for your wall. 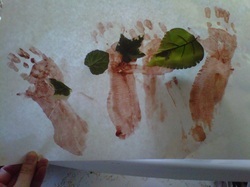 Simply paint the bottom of their foot with brown paint, then stick leaves (either the plastic kind from a craft or dollar store, or ones you gather in the yard) into the wet paint, and let it dry. Ok, everyone feel free to make fun of this, but I was a little impressed such young children can do it, and it's still fun. I'm not sure where I learned them, but I've been making them for years. 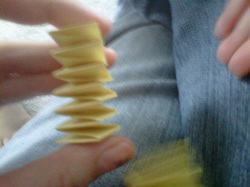 Honestly, it entertained my child for an afternoon. Hold the strips of paper to form an "L"
Cross the bottom piece over the top piece, ie fold the vertical piece down and across the horizontal piece, then fold the horizontal piece across the vertical one. Continue until you reach the end of your paper. These are great for Santa's arms and legs, put faces on the flat end and make a caterpillar, or put a construction paper flower on the top and you get a swaying flower. Use your imagination too see everything they can do!